Although it feels like biking season is underway here in Rossland, I’m not ready to put the skis away just yet. Jordy and I gambled on sunshine and some fresh turns off the summit of Ymir Peak (2398m), above Whitewater ski area, but the sun only made a brief early appearance, and the snow was almost uniformly firm. 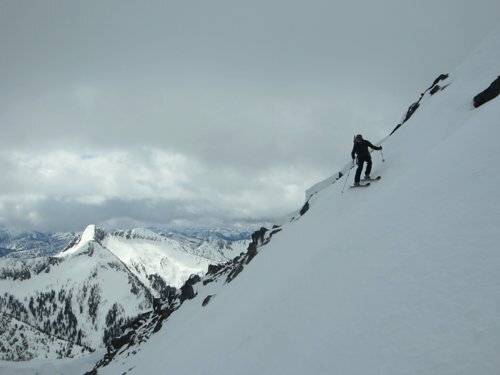 On the upside, the coverage was great, the snow-pack stable like concrete, Jordy got to use his crampons, and carving on the steep terrain was fun. Still skiing stew? Interested in a Loki or Brennan? Sorry I haven’t been checking my comments, otherwise you could have joined us in the Valhallas this past weekend.